The interior architecture of this Charlotte, North Carolina home radiates rustic elegance. 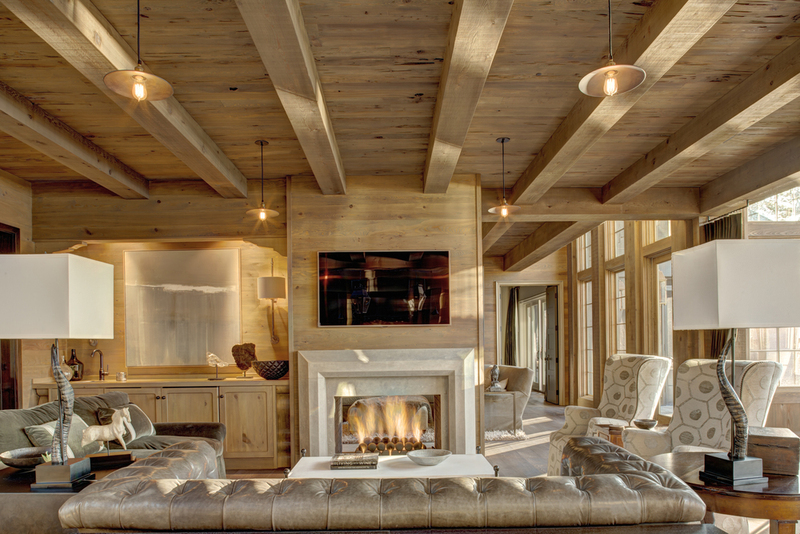 KBN Interiors matched the homeowners‘ modern sensibility with a warm signature style all their own. From the floor-to-ceiling windows that frame sweeping lake views to the handpicked rare cypress rafters sourced exclusively in Georgia, the interior design of The Cove melds the homeowners’ longstanding history in the lumber industry with their love of the lake. Tall vertical windows welcome an abundance of natural light—a complement to the honey-copper tones of the wood-stained interior. Cream-colored furnishings and accent decor harmonize with the natural wood interior for an overall aesthetic rooted in modern simplicity. When the sun sets on Lake Norman, The Cove is lit from within. Industrial style fixtures, grand lanterns, and an elegant double-sided fireplace illuminate the space—a haven for all seasons. Entertaining in the high-ceiling kitchen is a fulfilling experience. The first-rate custom cabinetry, expansive counter tops and family sized island beg for reasons to gather and celebrate. Cozy and intimate yet open and spacious, this is the place where quality family time and entertaining guests will be joyful for countless years to come. Harmony follows when interiors are designed as a response to the homeowners’ vision, history and values. Layer by layer KBN Interiors worked closely with the homeowners of The Cove to create the dream that reflects— and will continue to shape—their family legacy. Rustic, elegant, luminous, and welcoming—The Cove is an architectural ode to the family’s heritage.